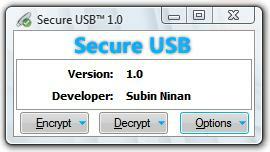 Secure-USB is an easy-to-use portable file encryption software.It implements strong 256-bit AES encryption to encrypt data. It uses users hashed password as key to encrypt & decrypt data,so it is strictly adviced to decrypt all files before changing password. Secure-USB runs on Windows XP/2003/Vista/7 or above. ★ Simple, fast and user friendly interface. ★ Implements 256-bit AES to encrypt files. ★ Uninstalling/Removing will not uncover encrypted files. ★ All file system supported.